My wife and I enjoy having a tv series or two to watch together on an ongoing basis, simply to relax in the evenings to a good and intriguing television programme. We watched all the seasons of Lost, 24 and Prison Break, some of the better shows that were available in the past decade. We also watched all of the Heroes’ series before the show was cancelled (which was for the best at that point with it really going no where). We also like to pull out the varying Friends series and enjoy them together. It was my wife’s show before we met, and now it has become a show we enjoy in tandem, regularly watching re-runs and laughing through them. We’ve also even tuned in to a couple of British BBC series, mainly Merlin (based upon King Arthur and the gang as in their young 20’s) and Lark Rise to Candleford (a period drama based in the late 19th century). We await the new season of Merlin to begin soon, with the latter (LRC) finishing in early 2011 after 4 successful seasons in Britain. But living in Belgium, it’s hard to keep up on new shows, at least from the States. We have enjoyed the CSI series (at least the original and NY, but not so much Horatio Caine and the Miami crew). Still, it takes the following year before we start seeing the new episodes from the US. And in the summer, nothing new really comes around. So, living in Belgium, we regularly check the iTunes store for a good series. Sometimes you can catch a free episode of a new show as a taster. Then, if you like it, you can consider purchasing the following episodes ($1.99 for standard definition, $2.99 for HD, which HD is not that much better quality). That’s what happened when we found out about the new show Alphas, which premiered on the Sy-Fy channel in mid-July. The pilot episode was free on iTunes. So we thought we would give it a shot. After the taster, we decided to continue on with it. 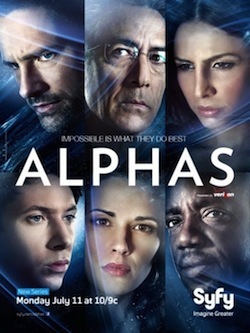 Alphas is quite like the show Heroes, or The 4400 (if you know that one as well). But Alphas has now put out 7 episodes thus far. I like these kind of shows, like a Heroes (goodness, they could have done so much better on that show and ended it out so much better). With Alphas, each character, except for the main character (Dr. Rosen), has a special ability, like a super-power. The main Alpha team, spear-headed by Rosen, are a kind of government endorsed group that help deal with problematic Alphas. But 7 episodes in, I am starting to think this is going no where. Mainly, I don’t sense a meta-narrative, a larger story for the characters, their development and the plot. The first couple of episodes were really setting the scene for the 6 main characters. But now, it is simply an introduction to a new Alpha during each episode, usually some kind of vigilante or person using their Alpha ability for harm rather than good. So, here I am, wondering if I should spend $1.99 next week to catch the 8th episode. My wife seems to think something is about to unfold with Dr. Rosen not wanting to fully comply with the government’s regulations for how his team of 5 Alphas operate. I’m not sure. Maybe. And I’m not sure this will create a great and intriguing story-line, other than the government trying to shut all Alphas down, leaving the team of 6 beginning to become vigilantes themselves. I think I might stick through this for another 6 weeks, through the end of season 1, to see how it all pans out. But I’m just not sure. I feel like we’ve been here and done this once before with Heroes (as well as The 4400). I guess I could spend another $12 or so. Come on, Alphas! Show me what you got! This entry was tagged Alphas, life, television. Bookmark the permalink. You can’t watch Alphas for free online on SYFY.com? Nope. On most of those sites, it says it is not available in my area. Or I would have watched LOST, 24, etc, all on ABC’s website. Contracts to not show outside the US until later dates. I enjoy most of those shows you mention. You might also like some shows like Warehouse 13, Eureka, and Sanctuary on SciFi as well. Another option you can consider is torrents. The legality of recording those online shows (probably OK) and sharing them (ify) is one of conscience, but it is an option. Have no idea what your laws there say about downloading a torrent of some video that has been posted on the web by its creator. I don’t download movies or music like that, but I don’t think I’d have an issue in downloading a show that the channel has already made freely available online. Also, you can probably use a proxy server here in the US to watch shows online on those sites as it identifies you as US. I left APLHAS after the premiere! Looked like regular TV stuff. HEROES lost it when the heroes didn’t do anything…well…HEROIC! It seems ALPHAS may be going down that same meandering road. Alphas hasn’t really impressed me, but I keep watching, hoping the characters will do more than whine at each other. If you want some good sci-fi with heart, check out the recently completed first season of Falling Skies. Characters with virtue and values who love each other and be heroic for each other AND some very imaginitive alien forms. Great stuff. Can’t wait for the next season.